It is common knowledge that flowers use bright colours and enticing fragrances to attract pollinators, but what’s not so widely known is that they also use electrical signals. Nobody knew about this electrical attraction until biologists recently discovered that bumblebees can detect a charge and use it to determine which plant they visit. Charge detection may help bees decide which flowers hold plenty of nectar. 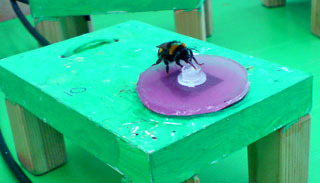 To investigate, biologists at the University of Bristol created artificial flowers, filling some with sucrose and others with quinine, which bees don’t feed on. Initially, the bees (buff-tailed bumblebees of the species Bombus terrestris) visited the flowers at random. 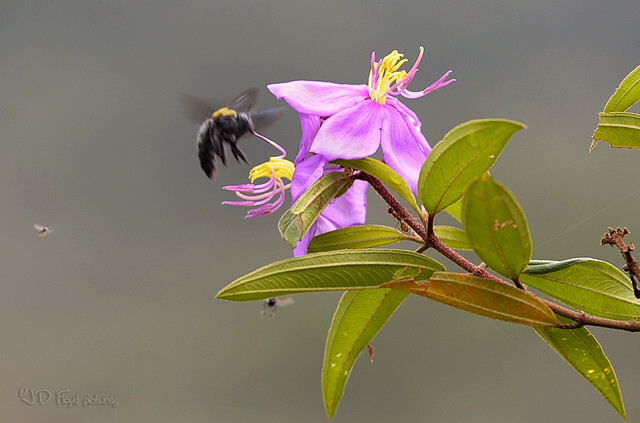 But when a 30 volt field, typical of a 30cm-tall flower, was applied to the artificial plants containing sucrose, the bees detected the charge from a few centimetres away, and visited the charged flowers 81 per cent of the time. When a bee visits a flower some of its positive charge transfers to the plant, and further bees transfer more charge. This could show an incoming bee that there’s unlikely to be much nectar on offer. “The last thing a flower wants is to attract a bee and then fail to provide nectar,” says Professor Daniel Robert, who led the research. It’s thought the electric charge supplements the other signals flowers use. Exactly how bees detect electrical fields is unknown, but the researchers speculate that the hairy bees bristle up under an electrostatic force. pokok senduduk warna ungu tapi saya suka warna putih. what a fascinating discovery. i learn something new today. thanks for sharing.